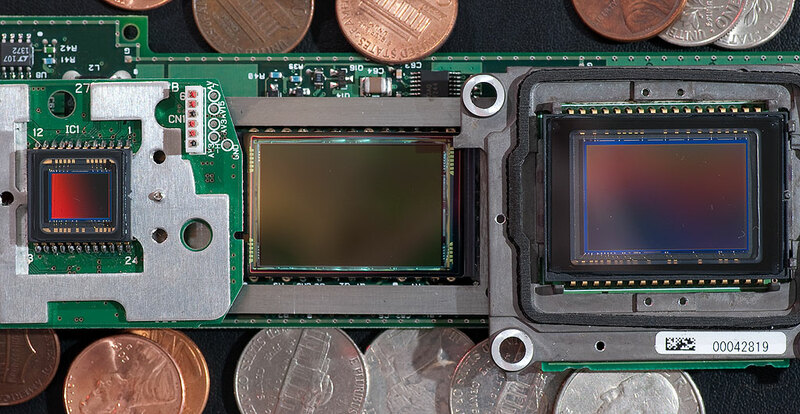 At the heart of every digital camera is one of these: an integrated circuit with tiny picture elements – “pixels” – that record light. Most have filters like anti-aliasing and infrared filters, and most have a Bayer Pattern Array filter. This is the modern equivalent of film. Yesterday afternoon after a brief electrical power interruption, I noticed that house wasn’t staying cool. I checked and found that the compressor and its fan outside the house were not running. A new compressor would be very expensive, and was not happy about it. 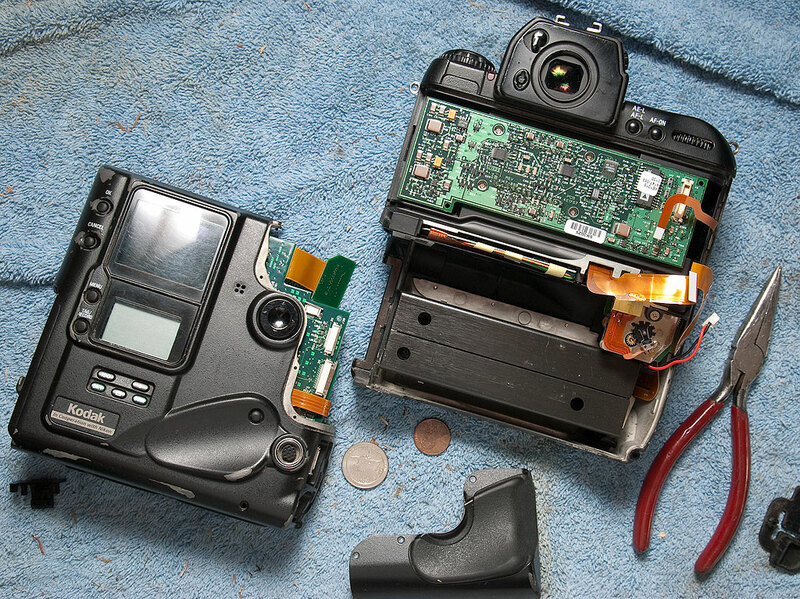 To help distract myself, I mowed and weed-whacked for a while, then when it got dark, I set out to complete a pointless but interesting (thus maybe not entirely pointless) task of taking apart a couple of long-dead digital cameras, a Nikon D100 and a Kodak DCS760. 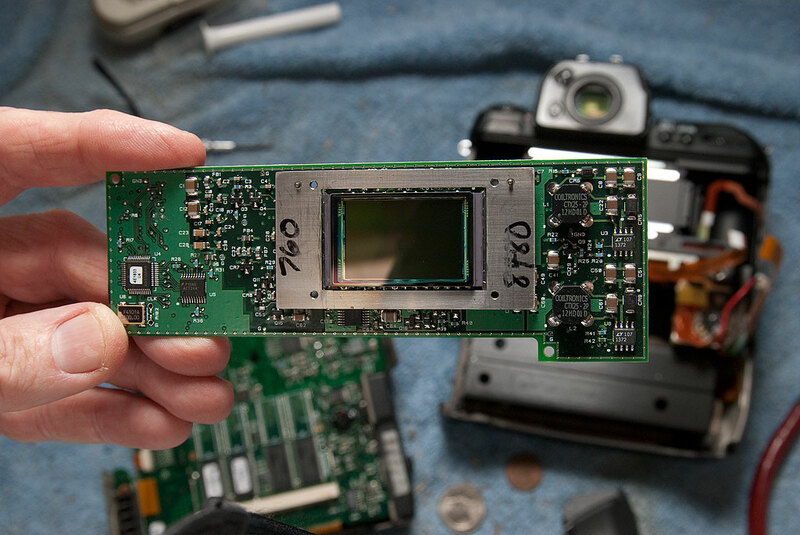 This is the sensor board from the Kodak DCS760. That’s not my handwriting, so I don’t know if it was marked this way from the factory or by someone who repaired it at some point. Just a few steps into dismantling this camera already makes it look like a skeleton. I got both years ago on eBay for a small fraction of their retail price, shot several years of images with them, then stuck them in a box in anticipation of a day like today. Both cameras date from the early 2000s, when digital photography was still evolving by leaps and bounds. Despite both cameras being rendered hopelessly outdated by the “futuretrash” paradigm, each made some amazing pictures in my hands. 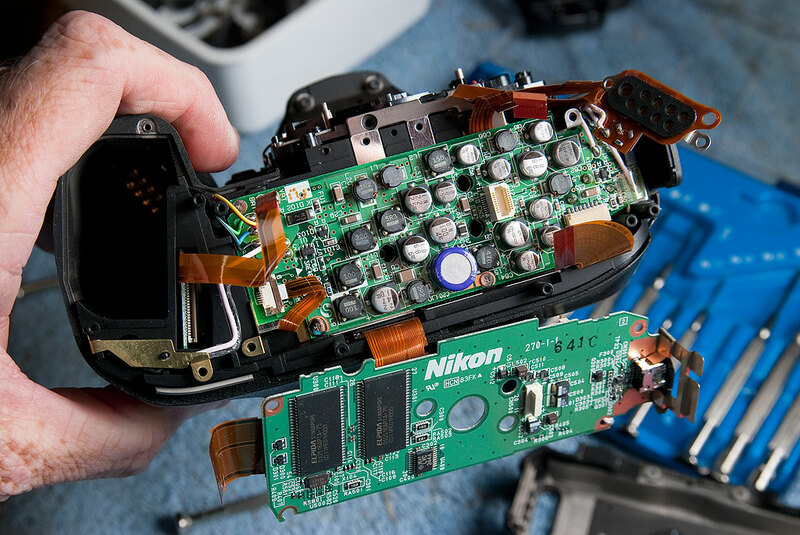 This isn’t a step-by-step tutorial about how to tear these things down, but a look at what’s inside these two cameras, with a few observations about how they were put together. I only had to remove about ten screws to get the back off the DCS760. The grip handle on the right side of the D100 holds this large flash capacitor. 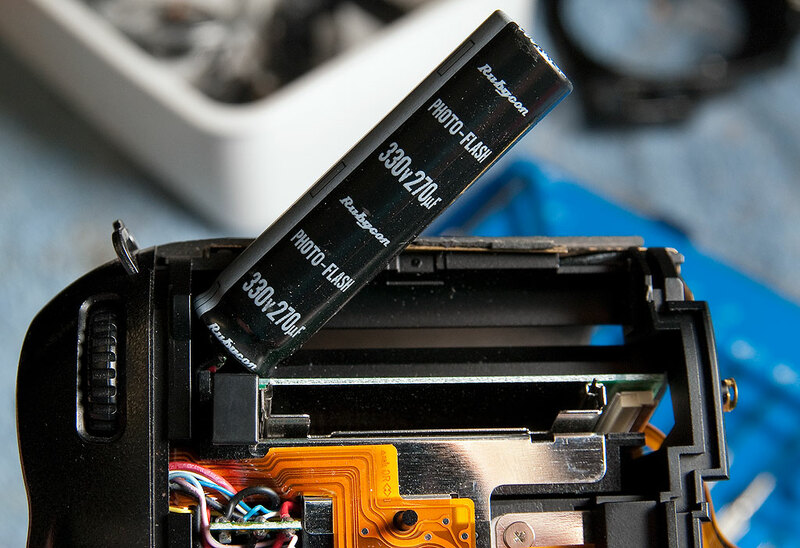 The DCS760 was put together as what we used to call a “Frankencamera,” meaning it was two distinct things, a film camera and a digital sensor, stitched together clumsily. The D100 seemed to be more elegantly designed, as though it was designed from the start as a digital. Both seemed like a miracle of science when compared to cameras from the beginning of my career when I honestly had no idea this kind of technology would come along. Both cameras had a lot of electronic bulk that I expect I would not see in newer cameras with more advanced design and assembly techniques. Both cameras were sturdy, and put up a fight when I tried to get inside. I don’t envy anyone ever tasked with repairing them. 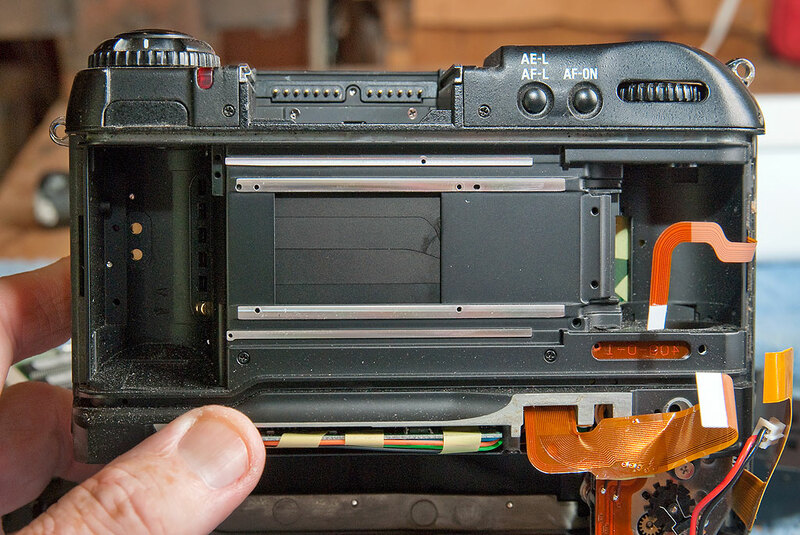 The “Frankencamera” aspect of the DCS760 is abundantly clear in this view showing empty space where a film cassette, on the left, and the space for film to wind, on the right, are empty. You can see many bulky capacitors and other circuits on the bottom of the D100. 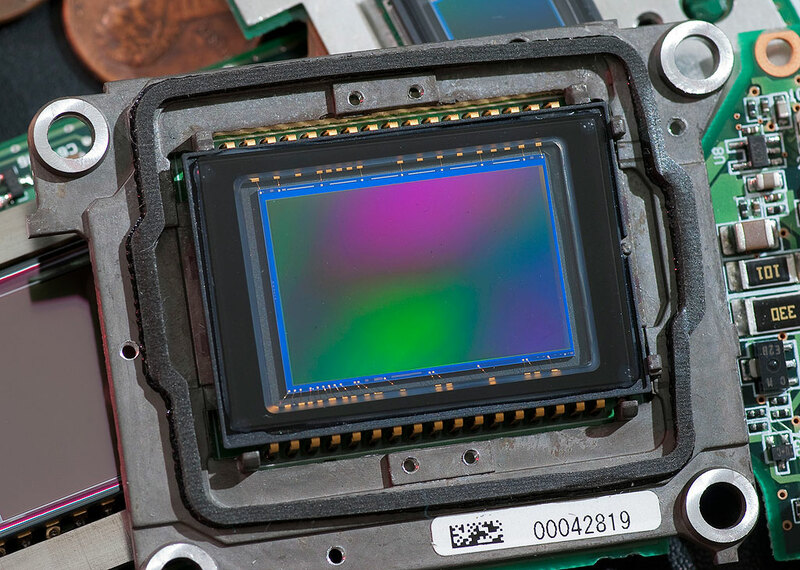 This image shows three sizes of image sensor. On the left is the Minolta DiMage 7i at 5mm x 7mm, in the middle is the Kodak DSC760 sensor at 28mm x 19mm, and on the right it Nikon’s D100 sensor, which measures 24mm x 15mm. All three sensors deliver approximately six million pixels. Very interesting indeed. I have a couple of old compact digital cameras sitting on my “camera museum” shelf. Perhaps I’ll try this some day, with a little help from my minions. 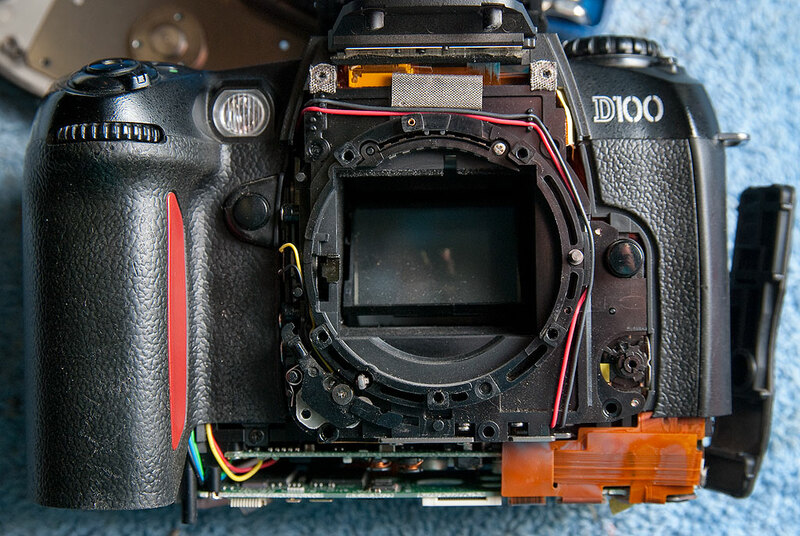 I’d like to see deconstruction of a lens. I think you have one here.